Beneficial nematodes are soil dwelling, microscopic roundworms that are natural predators of a wide variety of pest insects. Nematodes are roundworms that can be found across the earth, both on land and in the sea. They are prolific, making up as much as 80% of all animal life on the planet. There are hundreds of thousands of different types of nematodes; some are beneficial and some are detrimental to your garden. The three species of nematodes BioLogic produces are microscopic and insect pathogenic only, meaning they kill pest insects but are completely safe for people, pets and plants. We are nematode experts, and have been producing nematodes since 1985. When you buy from BioLogic, your nematodes will be coming directly from the producer ensuring the freshest product on the market. When purchasing nematodes it is imperative you buy nematodes from a reputable source. After all, you are purchasing a live, microscopic product meaning that for most people, it is hard to ensure you are getting what you paid for. Beneficial nematodes are only effective when the nematodes are living and healthy and used in high enough quantities to control the pest population. Many suppliers are actually re-sellers of nematodes, meaning they do not produce the product you are purchasing. Buying from a re-seller could mean you are purchasing nematodes that have spent too much time in shipment or storage, resulting in many fewer living nematodes than you paid for. BioLogic is a nematode producer, not a reseller, and our application rates are based on our own research, or the research of reputable institutions. We do not exaggerate application rates because we want to ensure you get effective pest control with our products and because when applying at the proper application levels you should not need to reapply very often. 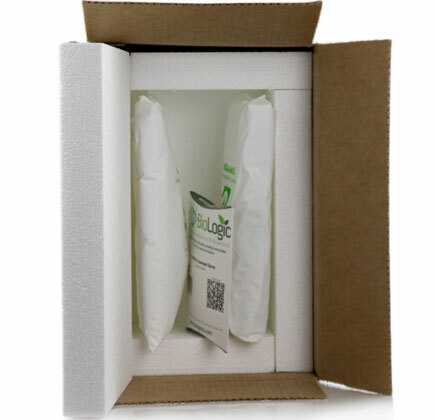 We take care to package and ship our nematodes in a manner that ensures you receive healthy, active nematodes. BioLogic has been in business since 1985, long before most people had heard or thought about going green. We have been able to stay in business and grow by delivering a good product that works! You can trust us to deliver an effective product that does what we say it will. Beneficial nematodes are a great, all natural alternative to chemical pesticides. There are many reasons to consider using beneficial nematodes for pest control on their own or as part of an Integrated Pest Management (IPM) program. Nematodes are naturally occurring predators of a wide variety of the most common insect pests. Beneficial nematodes are a great, all natural alternative to chemical pesticides. There are many reasons to consider using beneficial nematodes for pest control on their own or as part of an Integrated Pest Management (IPM) program. Nematodes are naturally occurring predators of a wide variety of the most common insect pests. Though beneficial nematodes actively hunt down and kill pest insects, they are non-toxic, environmentally friendly and completely safe for people, pets and plants. BioLogic’s nematodes are a great, safe alternative to harsh chemical pesticides and are safe for use around your children and pets in your home, lawn and garden. But aside from the safety benefits, there are many other reasons to use beneficial nematodes. Pest insects can build up a resistance to conventional chemical pesticides, meaning eventually stronger and harsher treatments are needed. This is not a risk with beneficial nematodes; insects do not build up a resistance to these natural pest predators! Another benefit of beneficial nematodes is that they are a targeted control. The nematodes in BioLogic’s products target many common insect pests, but are completely harmless to many beneficials like ladybugs, praying mantises, earthworms and bees. You can safely use beneficial nematodes without fear of harming other non-target organisms unlike with chemical pesticides. Beneficial nematodes are, however, compatible with most insecticides, herbicides, fertilizers and other commonly used chemical controls making them a great addition to Integrated Pest Management programs. Finally, beneficial nematodes last longer than traditional chemical pesticides. Beneficial nematodes live in the soil and will generally live at levels high enough to control pest insect populations for around 18 months after application depending on conditions. This means that you can go much longer between treatments as compared to chemical pesticide alternatives.